Are you a driver? If you are then are you a driver who becomes easily distracted? Or do you even feel so confident driving that you often find yourself multi tasking and doing other things whilst driving such as, applying make up, eating breakfast or even preparing a speech for work? Well, despite drivers in the UK being well aware of the risks attached to these types of behaviours and irrespective of the fact that being caught doing anything whilst driving other that the actual driving itself comes with hefty fines and potential points, many UK drivers still admit to allowing them self to be distracted whilst driving. According some recent research carried out by personal contract hire company Lease Car the biggest distraction to a driver is noise and if you are anything like me you will be able to agree with this as I go as far as turning off the radio if I need to park in a small space that requires extra concentration. For me it doesn’t matter what type of music is playing if I need to concentrate it has to be turned off, however the research shows that the most distracting types of music are heavy metal, electronic and rock. When asked about their eating and driving habits 32% of people admitted to eating whilst driving with 27% of those opting for chocolate bars and sweets compared to 13% who like to eat burgers and chips whilst driving and 11% who are happy to admit eating their sandwiches. 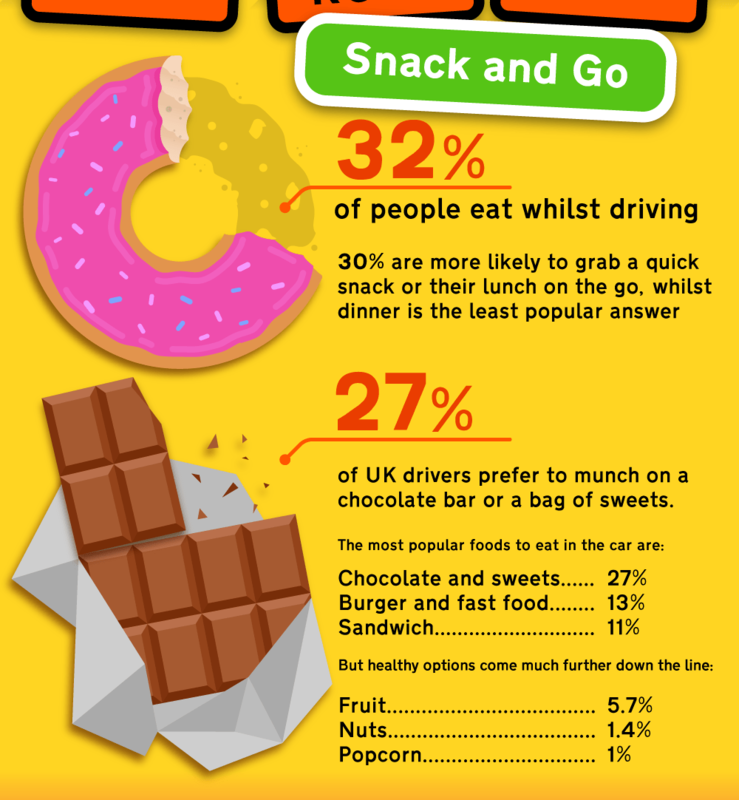 However it is important to point out that whilst the majority of snacks that are eaten whilst driving are unhealthy options there are still many drivers who admit to eating healthier options such as the 5.7% that admit to eating fruit and the 1.4% that opt for nuts. 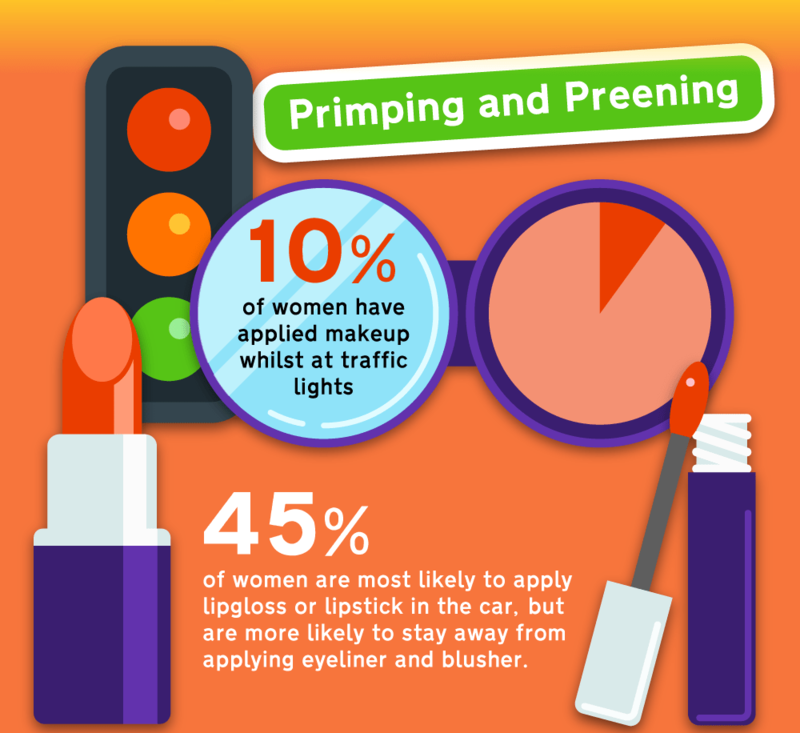 A further distraction that was uncovered came from the women with 10% admitting to applying make up whilst at the traffic lights with 45% of those suggesting they would apply lip gloss and lip stick but would avoid applying eyeliner, which is something I guess. When I was first presented with this study I was surprised at the results but then I thought about how many times I have spotted a driver with one hand on the wheel and the other clutching a burger, especially on the motorway. I guess it is really easy to allow ourselves to be distracted but in reality we really should make a more conscious effort to be sensible on the roads, after all many of us often carry passengers including our own children, family and friends and when we allow ourselves to be distracted by in car karaoke, eating on the move and fixing our make up amongst other things, ultimately we are putting ourselves, our loved ones and others at risk of great harm were we to have an accident, an accident that could easily have been avoided had we remained focused on the task at hand. I would love to know what you think about this research and if you too have allowed yourself to become distracted at the wheel of the car before.